어쩌면 외부와 단절된 느낌이 들 수 있습니다. 장중하며 메시브한 건축어휘만 보입니다. (외부로 들어난 통창이 없기 때문에 그렇게 더 보여집니다.) 오히려 내부로 열린, 하늘로 열린 주택이 완성되었습니다. 주거 밀집지역에 위치한 주택은 인접한 주택으로 부터 시선을 차단하는 작업을 먼저 반영했습니다. 슬릿한 개구부가 수평과 수직으로 메스를 분절하는 어휘로 적용됩니다. 그럼에도 불구하고 내부 조도환경을 위해 빛을 적극적으로 유입하기 위해 긴창들이 배치 되었습니다. Toyonaka의 House는 Fujiwaramuro Architects가 설계 한 일본 Toyonaka에 위치한 최소의 거주지입니다. 오사카 북부의 주거 지역에 위치한이 숙박 시설은 밀집된 주택으로 둘러싸여 있으며 뛰어난 경치는 없습니다. 인접한 주택으로 인해 프라이버시를 유지하는 것이 가장 중요했습니다. 디자인의 목표는 그럼에도 불구하고 큰 창문이 없었고 외부 세계에 닫혀있는 자극적이고 아름다운 공간을 만드는 것이 었습니다. 건물은 3 개의 상자로 분리 된 하나의 매스를 포함하며, 그 사이의 공간은 신선한 공기, 햇빛 및 제한없는 시선을 제공하는 구멍의 위치 역할을합니다. 이 구멍의 크기가 작아서 하늘이나 거리의 갑작스러운 모습이 눈에 띄는 곳입니다. 햇빛이 그들을 통해 들어오는 방식 또한 주목할 만합니다. 그들은 햇빛이 시간이 지남에 따라 끊임없이 변하는 것을 의식하는 거주자를 만들기위한 장치로 사용됩니다. 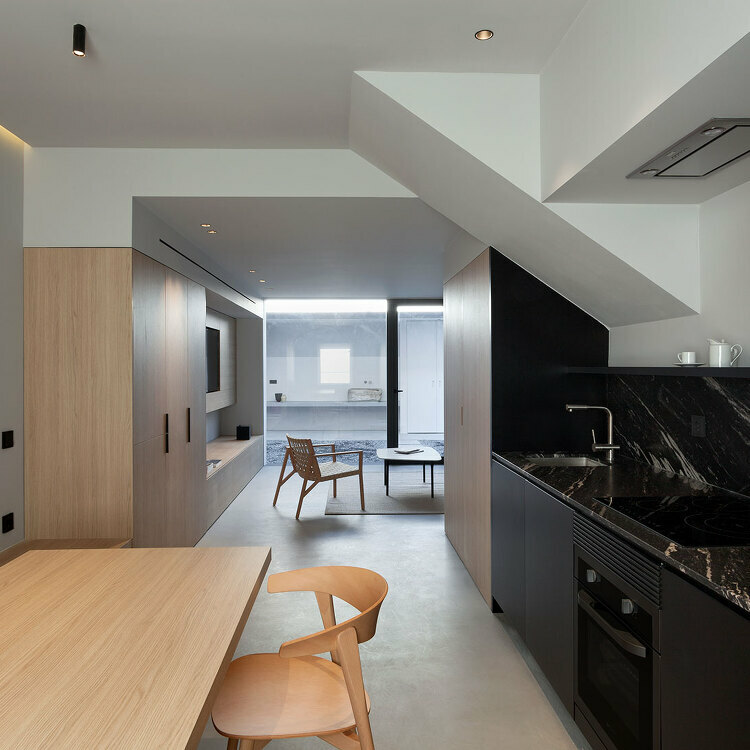 House in Toyonaka is a minimalist residence located in Toyonaka, Japan, designed by Fujiwaramuro Architects. Located in a residential district in northern Osaka, this property is surrounded by closely packed houses and lacks any outstanding views. Due to the adjacent homes, maintaining privacy was of the utmost importance. The aim of the design was therefore to create a stimulating and beautiful space that nevertheless had no large windows and was closed to the outside world. The building comprises a single mass divided into three boxes, the spaces between which serve as the locations for openings that provide fresh air, sunlight, and unrestricted lines of sight. The smallness of these openings is precisely what makes the sudden glimpses of sky or streetscape that they offer so striking. The way the sunlight pours in through them is also remarkable; they serve as devices for making the residents conscious that sunlight constantly shifts over time.